MK Regev tells Zoabi: Go to Gaza, traitor! Knesset members on Wednesday slammed MK Hanin Zoabi (Balad), who took part in the flotilla to Gaza raided by the IDF on Monday. Fears of violence against her by other MKs have led the Knesset to grant her personal security guards. MK Anastassia Michaeli (Yisrael Beiteinu) chased Zoabi in an attempt to keep her from speaking, and a fight broke out at the podium. Other MKs tried to separate between the two women, and eventually Michaeli was removed from the hall. 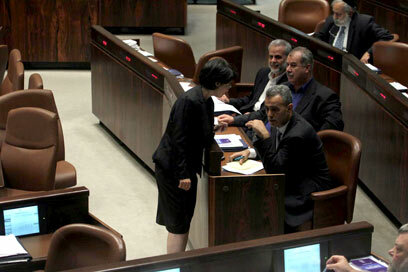 Each MK was allotted one minute to speak, but Zoabi took longer because of the many disruptions by other MKs present. When Knesset Speaker Reuven Rivlin asked her to descend from the podium she refused, and also had to be physically removed. MK Jamal Zahalka (Balad) was also one of the MKs forced out of the debate. Zahalka said that the entire world condemns the IDF raid on the flotilla to Gaza. "I want to call for the release of leaders of the Arab public," he told the plenum before his removal, referring to Sheikh Raed Salah and others who were arrested for taking part in the sail. "MK Zoabi deserves an award. She fulfilled her duty." MK Yoel Hasson (Kadima) intervened and said, "She deserves an award from Hamas!" He was also removed from the debate. A heated debate took place before the speeches as well. "Zoabi is party to a double crime – joining terrorists and a moral crime against the State of Israel," she said during a heated Knesset session Wednesday. "She must be punished. We don’t need Trojan horses in the Knesset." MK Miri Regev (Likud) even shouted at Zoabi in Arabic, "Go to Gaza, traitor." "She (Zoabi) stood here over a year ago and pledged her allegiance to the State of Israel and its laws. My intention is not to harm freedom of speech – but in MK Zoabi's case – this isn’t freedom of speech. The sail to Gaza was a sail of terror. Zoabi must be punished. We don't need Trojan horses in the Knesset," Regev said. MK Yohanan Plesner (Kadima) also told Zoabi to visit the Strip. "I just wish you would go to Gaza for at lease a week and then we'll see how you talk about women's rights and civil rights. Just one week, and we'll see what happens. One week in Gaza as a 38-year old single woman and we'll see how they treat you! You are the last person capable of preaching morals to us," he cried out. Rightist lawmaker Moshe Mutz Matalon (Yisrael Beitenu) told Zoabi, "Nice work. In one day you've managed to accomplish what the treacherous people around you have been trying to do for years. Unfortunately, the (commando) fighters (who raided the aid flotilla) acted with too much restraint. They left only nine floating voters." MK Nachman Shai's (Kadima) attack on Zoabi was a bit more refrained. "I respect democracy, but an MK cannot participate in such a journey, which is against the law and deifies the country that is mine just as much as it is yours. "I respect your opinions, but it was wrong of you to stand on that ship's deck. It's unacceptable," he added. Next to speak was Hadash chairman Mohammad Barakeh. "We stand by our colleague MK Zoabi and consider her actions noble, as they were meant to lift the siege off of an entire nation." Rightist MKs interrupted the Arab lawmaker's speech with calls of "Enemies. Enemies. Shame on you." Barakeh responded by saying, "You are trying to justify the cold-blooded murder of protestors. The responsibility does not lie with the soldiers, but with those who organized this crime – mainly Netanyahu and Barak. "I am holding the political echelon responsible. Not one country is taking Israel's side in this crime. You are swimming against the entire world. You are hurting your own nation," said Barakeh. See all talkbacks "MK Regev tells Zoabi: Go to Gaza, traitor!"